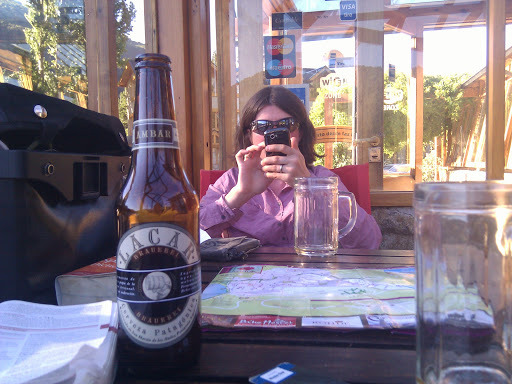 Yet again we find ourselves enjoying a nice beer in the afternoon sun, with a great mountain and lake view. An appropriate way to spend our last day in the Argentine lake district (probably) . We had a good cycle to get to San Martin, fortunately it was only about 6km before we hit pavement. The road then gently undulated upwards towards the final large descent into town. The descent was fun as we had a large construction truck slowly catching us. We could corner faster than it, but it was faster on the straights. It gave us a friendly toot when it finally passed us as the road finally levelled out, and we both gave it a wave. We've seen a few friendly vehicles today, including the van (and associated family), who were camped near us last night. We saw them at our morning tea/coffee/provisions stop, a waterfall mirador, and at our lunch stop. We're staying at the 'bike hostel ' in San Martin. It's a great place full of bicycles. They clearly spend the winter snowboarding too. Must be quite a nice life! There weren't many others there when we arrived, as one of the reasons we wanted to stay there was to get information to decide what border crossing to take into Chile, and the best way to cycle quickly from Temuco to Santiago. We need to decide which route to take tomorrow! There are three crossings to choose from, with an additional ferry option on one of them. So it's large meal, map and deliberation time. Wednesday 23 Feb: power up! Tuesday 15 Feb: What to do Wednesday? Tuesday 8 Feb : the bike was clean! Saturday 5 Feb: ripio woes, paved road woo!